The Coasters are an R & B group that started in October 1955. 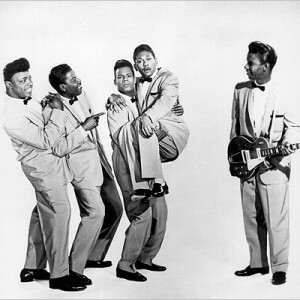 The original members of The Coasters were Carl Gardner, Billy Guy, Bobby Nunn and Leon Hughes. In 1957, both Bobby Nunn and Leon Hughes were replaced by Cornell Gunter and Will (Dub) Jones. In 1956, The Coasters released their first hit “Down In Mexico” which sold 500,000 copies and in 1957, they topped the R&B charts and made the pop Top Ten with their double-sided single “Searchin’” and “Young Blood”. Over the next two years, the Coasters released a series of hit singles filled with instantly adaptable slang and timeless humor. “Yakety Yak” comically addressed the generation gap long before that term was coined, while “Charlie Brown” was a character study of a class clown that featured Will “Dub” Jones’ unforgettable line: “Why’s everybody always pickin’ on me?” By the end of the decade, they’d carved out a legacy for themselves as purveyors of riotously funny rock and roll records with a solid R&B underpinning. For that reason they were labeled as the “Clown Prince’s of Rock N Roll”. The Coasters were also popular in England, where the Beatles, the Rolling Stones and other British Invasion bands covered their songs. Ironically, it was the rise of the British Invasion that spelled commercial decline for such Fifties icons as the Coasters. Leiber and Stoller left Atlantic in 1964 to found their own label, Red Bird, while the Coasters continued to record for Atco through 1966. The Coasters, Leiber and Stoller reunited in 1967 when the Coasters signed with Columbia Records’ Date subsidiary. The Coasters and Leiber and Stoller last worked together in 1973. In 1987, “The Coasters” was the first group inducted in “The Rock and Roll Hall Of Fame”.